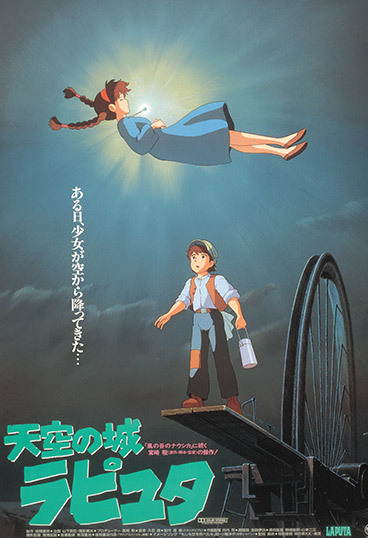 PennsylvAsia: Studio Ghibli's Castle in the Sky (天空の城ラピュタ) in Pittsburgh area theaters, August 27 and 28. Studio Ghibli's Castle in the Sky (天空の城ラピュタ) in Pittsburgh area theaters, August 27 and 28. A young girl with a mysterious crystal pendant falls out of the sky and into the arms and life of young Pazu. Together they search for a floating island in the sky, site of a long-dead civilization promising enormous wealth and power to those who can unlock its secrets. Castle in the Sky is an early masterpiece of storytelling and filmmaking whose imaginative and ornately detailed vision presaged later films like Princess Mononoke and Spirited Away. An English dubbed version will play at the Cinemark theaters in Monaca, Monroeville, North Hills, and Pittsburgh Mills on August 27, while a version with English subtitles will play at those theaters on August 28.